If you are active, it's important that you invest in a good sports bra for your breast health, just as you would in a good pair of shoes for your sport. When you are larger busted, it can be uncomfortable or even painful to do high-impact activities without proper breast support. The ligaments in your breasts, as well as your skin, can experience lots of movement and the right sports bra style in a good fit will restrict movement and reduce any damage or fatigue to these ligaments in your breasts, which cannot be undone. A good fitting sports bra is essential for active, full-bust women as it can prevent fatigue and breast pain, while also improving your performance. What should I look for in a sports bra? Using the same fit criteria as your everyday bra, try a new sports bra in the same size as your best fitting bra, keeping in mind international sizes, as bras from different countries will be sized differently. The back band should fit firm and be level across the body. The centre front of an underwire bra should sit firmly against your chest. A style without wires should not gape, and the neckline edge should fit comfortably firm and contain the top of the bust. Your breasts should be fully contained within the cups - no tissue falling through the bottom, or bulging out the tops or sides of the cup with the wires resting flat against your body. The shoulder straps should be a comfortable pressure on the shoulders. It's important that the band of the sports bra is firm and fits comfortably on the loosest row of hooks so that you can tighten the back band as the bra stretches over time. 80-90% of the support comes from the back band, and the straps provide the last 10 - 20% of support. Choose your sports bra in the same size as your everyday bra, but note that a sports bra will often feel a little bit firmer. Some women prefer that their sports bra fits much tighter than their everyday bra, but make sure the band is not too tight and that you can comfortably take deep breaths without the band or wires pinching or cutting. A sports bra with underwires isn't necessarily more supportive than one without. Some sports bras without wires are just as supportive for high impact activities that involve running and jumping. Internal structures will work to encapsulate the breasts while firm fabrics and seamed cups will offer further support to reduce bounce and movement. Most often, the choice comes down to personal preference and comfort. A non-wire sports bra will fit differently, and some women find it does not offer enough separation to the breasts. The lack of separation doesn't necessarily affect the fit or support of the bra but is a personal fit preference to the wearer. Certain movements or types of exercises may also feel more comfortable in a non-wire sports bra, especially if worn for an extended period. Most sports bras designed for women with larger busts have encapsulation styling. Encapsulation means that the bra is designed to separate the breasts and offer support to each breast independently. A compression style sports bra is quite different in design with the primary function to compress and hold the breasts tight against the body to reduce movement. Because of its nature to compress, this style of sports bra often does not come in cup sizes, but general 'Small' to 'Large' sizing, or sold by dress sizes. 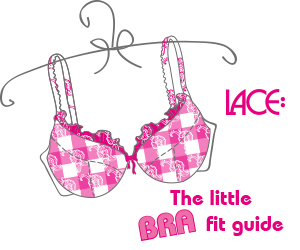 All of the sports bras available at LACE have an element of encapsulation design. Styles will either have underwires that physically separate and encapsulate the breasts, or non-wired styles that offer support with inner structures, or have depth to the cups to allow room for the breast. Some styles combine the best of both encapsulation and compression by separating the breasts, and then compress by restricting the movement by using stretch fabrics or firm panels to hold the breasts in place; or they may use shallower, moulded cups to limit the projection, while not directly flattening the bust. Selecting the right sports bra for you will also depend on your level of activity and the amount of support that you need. LACE provides a Sport Rating Sports bras with a rating of 1 to 2 are most suitable for low-to-medium impact activities such as yoga, walking, and strength and resistance training. Styles with a rating of 2 to 3 are more appropriate for medium impact activities such as biking and skiing. Finally, those rated 3 to 4 are best suited for high-impact exercise that includes running or jumping or even an activity like horseback riding. If in doubt of which level of support to choose for your activity, select the higher Sport Rating for increased support. Many sports bras have the ability to transform the shoulder straps from a regular bra style to a racerback style. The racerback feature can be created from the use of a small J-hook attached to the bra to connect the straps together or may have hooks on the back of the straps allowing you to cross them over. By transforming the shoulder straps, you can change the fit and increase the support of the bra. By bringing the straps together, it results in the breasts being brought closer to your centre of gravity and reducing the bounce. By doing this, the shoulder straps are also positioned higher up the shoulder, reducing any chance of them slipping. Some women find the pressure higher up on the shoulder to be uncomfortable or painful on the neck, so try this feature out before an extended workout. Shoulder straps should be made of firm materials to restrict bounce, and wide and padded shoulder straps are often found on sports bras as they help to more easily distribute the weight and pressure of the bust, increasing your comfort. It can be difficult to put on a style with the straps crossed over in the back, or those with a racerback design. The bra must be pulled over the head and brought down over the shoulders to clasp in the back. Some styles of sports bras have the straps positioned closer in the back or a racerback feature that opens fully with back closures. In these cases, it can be easiest to fasten the top closure first, then pull the bra over your head, and then reach around the back to hook the bottom. It will become easier with practice. Whether you're in the LACE showroom or trying on your bra in the comfort of your home, it's important to test your sports bra. Try jumping or bouncing in place to see if the bra gives you the hold and support that you need for your activities. Twist, bend and reach to see if the bra remains in place and if the shoulder straps, and where they are positioned, is comfortable. It's important that you can get the full-range of motion with your arms and that there are no points on the bra that will rub or chafe after a long workout. Sign up for our newsletter and receive great offers, discount codes and news on latest arrivals. All prices are incl. VAT and without delivery costs. * Free delivery from £50. Minimum order value £40. See our terms and conditions.